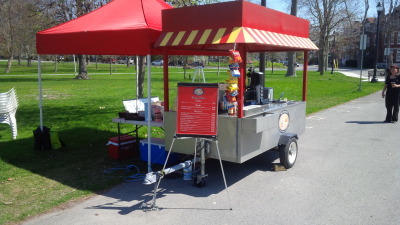 We started our business in July of 2013 at the splash park in City Park, Kingston Ontario. 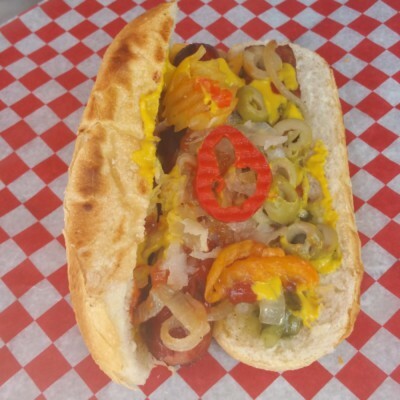 In that first year we set our focus on various gourmet hot dogs like Chicago, New York, Taco and Japanese hot dogs along with all beef sausages. We also attended an event in Odessa Ontario to evaluate street vending versus focused events. In 2014 we adjusted our menu based on customer feedback. We moved from selling gourmet hot dogs and focused on just two types of all beef hotdogs, a ¼ lb version and a child friendly smaller one. We changed the all beef sausage to an European style with two options, mild and medium. We also added some items to the menu: all Angus ½ lb beef hamburgers, sandwiches (roast beef, ham & cheese, pulled pork, bacon egg & cheese and smoked meat) as well as fries and hot drinks (coffee, tea & hot chocolate). We then decided to add more value to our customers with a value meal combo for $5.00. While still based in City Park in Kingston we decided to attend more weekend events as well as being asked to do our first catering job for a government client. The government client was so impressed with the value and the quality of our food and service that they asked us to come back several more times. In 2015 we reviewed our sales by product and decided two things: we slimed down our selection of sandwiches to roast beef, pulled pork and bacon egg & cheese and we increased our combo meal selections because our customers found them more convenient and better valued. Using our base out of City Park in Kingston Ontario, we significantly increased our participation in events. We attended the Scottish & Victoria Day Festivals in May; ArtFest throughout the Canada Day weekend; the Sheep dog trials, the Gay Pride Parade, Children’s Buskers, Trenton Antique Car Show and, the Picton Women’s Arts & Craft show in July, the Kingston Women’s Art Show and Belleville Fall Fair in August; and the Kingston Fall Fair and Streets Alive in September. Our Catering also increased with a biweekly commitment from our Government customer running from June to the end of October as well as a miniature horse Poker Derby and some private catering for a children’s summer camp.